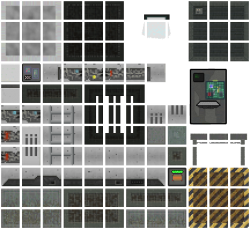 I decided to split the tiles from the Sci-fi platform tileset that was posted back in Feb. It just makes it easier to use as a spritesheet. I am using this in a new mobile game that is coming out, so I figured I'd post some of the assets here, with more to come. The original work is CC0 so I figured I'd upload this under the OGA By and request you give a shoutout to OpenGameArt if used. Hello, I was wondering if I could use this tileset i an upcoming game that I'm creating (My first, in fact!). I'll make modifications, and give you credit.